At Balsam Hill, we have made it our mission to bring you picture-perfect holiday décor and share our love for all things beautiful. This season, we’re back with our 12 Bloggers of Christmas campaign for the third year in a row. A selection of talented and creative bloggers will show us their Christmas décor, with a Balsam Hill tree as the resplendent centerpiece. Our very own design consultant, Dagmar Obert, will kick off this exciting campaign in a separate post later today. Along with Dagmar, we have a terrific line-up of accomplished bloggers who will open their doors to us and let us take a peek at their decorating themes this year. 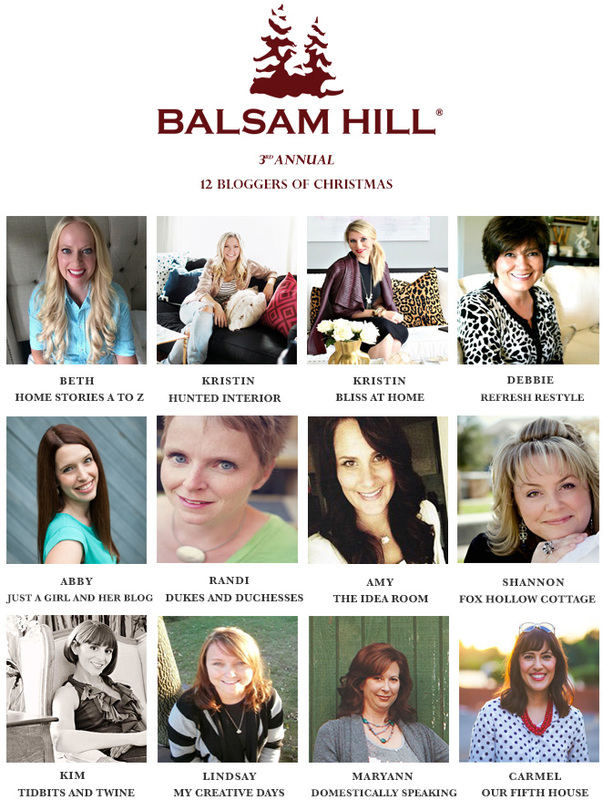 The series will be wrapped up by Courtney of French Country Cottage, with a post on November 29 sharing her own Balsam Hill tree décor. Join our giveaway and get the chance to win one of 10 gift cards valued at $100, a gift card worth $300, or our top prize of a $750 gift card, which can be used to purchase one of our elegant Christmas trees. Simply perform the actions below and you may be one of our lucky winners! Visit us in the following days for blogger features, sneak peeks, and more updates on this exciting decorating campaign! Christmas means Love! Sharing! Caring! and should be everyday. Christmas to me means celebrating the birth of my Jesus. Christmas to me means listening to beautiful Christmas music, enjoying a roaring fire, nibbling and eating lots of yummy food, giving and receiving gifts of LOVE, and most importantly, gathering together with my precious family celebrating this glorious day all unto our Savior! Christmas is about celebrating Jesus, family traditions and lots and lots of cookies. Christmas means a big dinner Christmas Eve followed by Midnight Mass and then Christmas morning watching everyone give each other presents and everyone laughing and talking! Christmas in the South celebrates friends, family and neighbors and means putting aside our troubles and partaking in decorating, lighting up our small portion of the world, and indulging in old family recipes and adding new ones to the menus. I love watching the familiar movies, baking and decorating the tree with my lights twinkling, while drinking a cup of coffee. This portion of my year makes the world a better place no matter how hectic it can be! Christmas is a gift to self and others. A time to look inward and a time for forgivness, A time for second chances and new beginnings. Spread the peace and love to all I encounter. Thank you my Lord. I love seeing real joy in others and I believe it is because we forget ourselves, we reach out to those in need and there is a wonderful spirit in the air. Chrismas means sharing extra time with family, showing more love to our fellow man, sweet smells in the kitchen, watching the old Christmas movies , and finding that perfect gift for a loved one. Christmas now means sharing the joy of the season and setting up traditions with our toddler daughter who for the first year will get a little more into it. I’m getting decorations up as early as possible so she can enjoy them. I’ve never had a fake tree, but with little ones the appeal is huge from ease of setup to lack of needles, especially when they look as real as these do. For me it means family, love and laughter. Christmas means celebrating with family and friends, sharing love and traditions and creating memories that strengthen bonds. I love decorating for Christmas, bringing out treasures from years past and finding a few new ones each year to add to the fun. Christmas also means beautiful music, good food, and helping others – focusing on the goodness of life. Christmas means Jesus birth and spending time with family. For me Christmas means love, joy, happiness, stress and sorrow, all wrapped into one big box. Love and joy come from watching my grandchildren enjoy the season, stress from the feeling that everything needs to be perfect, and sorrow from the loss of my father on December 26th a few years ago. Christmas is time with family, time for memories, time to relax and time to give to others! Christmas means peace, joy, and family time – warmth and coziness galore! Christmas means celebrating the world’s greatest gift with family and friends, decorating, baking, and giving. christmas is all about magic and family time! To me, Christmas means spending time with loved ones and enjoying each other’s company. I’m grateful to have such a wonderful family. Christmas is about love. God’s love in giving us his only son, our love for family and friends, togetherness and giving. Christmas is a special time for memory making surrounded with wonderful sights and smells. Christmas is the birth of our Savior! Christmas means I get to see my kids hopefully. Christmas means love and family! Christmas means love, happiness, wonderful times with family and friends and presents! Christmas means the birth of Our savior and cherished family time. Christmas means family, love, and being thankful for what you have. Christmas is giving and time off work! Love the feeling of having all the kids and all the noise and all the happiness on Christmas morning! I am trying to enjoy every minute!